Vernon Jones has definitely not had a good weekend. (Tom Crawford has the story.) The guy who has already been a thorn in Jones' side as a television journalist, will be running against him for the Democratic nod for Senate. 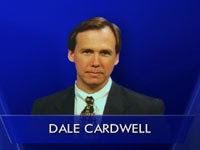 Dale Cardwell, investigative reporter with WSB, the guy Creative Loafing picked as the "Best Real TV Journalist" for 2006, will announce on Monday that he's entering the race. My guess is that he has already done his opposition research. Cardwell is a very interesting candidate. Not being from Atlanta, I don't know much about him, but ten minutes with Google yielded enough info to convince me that Jones is about to have his hands full. This guy is a seasoned (21 years) investigative reporter. And, it would be one thing if Cardwell just had it in for Jones, but the fact is that this is a guy who has gone after corruption where ever he smells it. He has taken on Democrats and Republicans alike who have abused the public trust. He called Perdue on his use of the state plane and Miller on his "Mansion Fund." From the stories he has covered, Cardwell seems like a guy voters could count on to fight for them. And, he has such a tough stand on immigration that I'm not even sure I agree, and the fact that I don't means that folks like D.A. King have been caught singing this Democrat's praises. Imagine what he'd do to Saxby with that in the general election. Cardwell is a conservative Democrat with high name ID in metro. He has a Lou Dobbs thing going on, but he's better looking. (Sorry, Lou.) It goes without saying that Cardwell is comfortable in front of the camera. He is a populist, not a politician. And he knows where all the bodies are buried. Where do I send my check? Cardwell throwing his hat in the ring will certainly spice this race up. I also think he would make an extremely tough opponent for Saxby to beat in the general election. This is very interesting. Y'all probably aren't old enough to remember when popular newscaster Hal Suit ran for governor as a Republican back around 1970. GWV, Nice job with this post! At first glance, this guy looks like a winner. Let's see if he can raise the cash. Thanks, Track. Finally, a real candidate! Thank goodness. Does anyone know how I can get in touch with him or his campaign?